Peonies: Varieties to Look For This Year!! With the arrival of spring comes the much anticipated onset of magnificent peonies. Each year, the peony season comes and goes with mostly the same varieties. You may recognize varieties like ‘Kansas’, ‘Sarah Bernhardt’, ‘Jules Eli’, ‘Festiva Maxima’, and ‘Duches de Nemours’. Oh, and don’t forget ‘Coral Charm’, ‘Coral Sunset’, and ‘Red Charm’. These have become the staple varieties that we know to ask for year after year. Some of these varieties are earlier blooming cultivars which we have grown to depend on, but over the years new varieties that tend to bloom later in the season have become more plentiful. Many of these varieties have been hybridized over the decades. New doesn’t necessarily mean recently created. New could be, and often is, defined as meaning the varieties have been around a long time but have finally become more available to the masses. Peonies can be a tremendous expense to plant, both in capital, labor, and land. Many varieties take a minimum of three years before blooms can actually be harvested. As you can imagine after millions of dollars have been spent in plants, the idea of tearing them out of the ground and starting with new varieties isn’t very attractive. This is ‘Paul Wilde’. An amazing fuchsia with an incredibly high petal count. This fabulous variety opens reliably into a large flower with a big wow factor. It adds that degree of moodiness to any rich romantic color palette. The color is so intense it’s sure to draw your customer’s eyes straight to it. There’s a short story with this variety. When I first bought this peony, it was sold to me under the name ‘Flat Top’, and I posted it on Instagram as such. Then, one of our followers was kind of enough to give me her thoughts on the variety. I was very grateful, since I always want to be correct when posting new varieties. At the time, I found images that matched under both names. However, I do think the name is ‘Do Tell’. So I listed that first above. This is a very interesting peony with all the color in the center of the flower and the pink petals that continue to fade as it opens. It blends with almost any palette. Because it opens quickly, I would leave it in the cooler as long as possible. The color in this flower has the ability to create color bridges or help with transitioning interesting color combinations of flowers. In my hunt for salmon color peonies, I came across the next two varieties in Holland. Their names say it all, and I just had to try them. As you can see in the pictures, they really aren’t salmon. I will say that they start salmon-ish and then open to pink. ‘Etched Salmon’ is a beautiful peony. It opens slower than the variety below and when you see all the petals you know why. It just keeps opening and opening to the magnificent flower you see above. They consistently open with a combination of tones throughout the flower. You naturally see the darker pink inner petals that fade to the lighter pink outer petals. I would never hesitate to try this variety if given the chance. When the flower fully opens it’s almost a complete sphere. Amazing!! If you need a fast opener, this is it, ‘Salmon Saucer’. Being in the single family of peonies, it has few petals. These two varieties look identical in the bud stage. If you use your fingers and pinch the bud the single peonies feel hollow compared to a double or semi-double. If they get mixed up you can use the pinch test to tell them apart. They are beautiful, but some people are turned off with the yellow pollen filled center. Often brides and customers that want the pink of the peony are not happy with this center. When fully opened, it reminds me of the flower from Magnolia grandiflora. Being that white is the number one color in demand for most weddings, I’ve included two that you may not know. If you do a lot of weddings especially in late May and June you may have lucked out over the last two years and found these show stoppers. 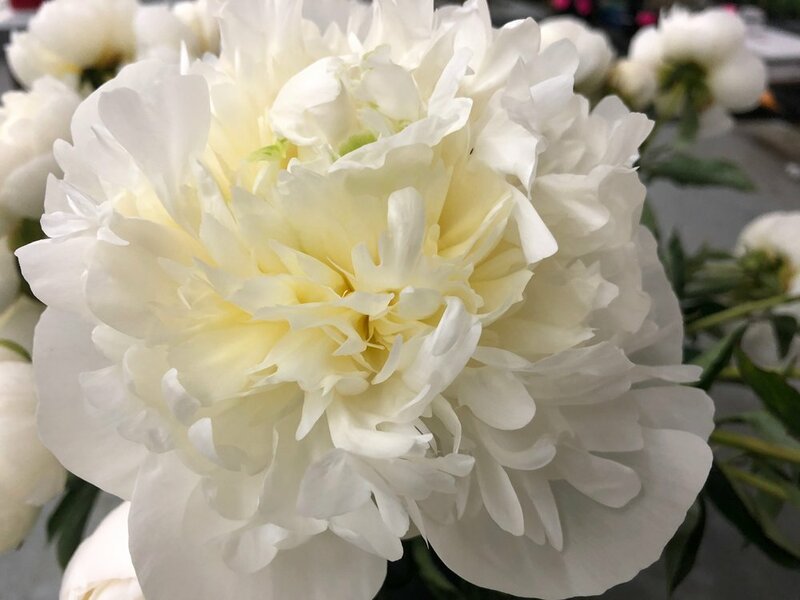 This peony contains beautiful petals with a feathery center. The petals, as they approach the center sometimes have a slight yellow cast to them. However, when it opens completely, it reads white to me. I guess it depends on the color palette you may be using with it. It is definitely whiter that ‘Duchess’. The petal count makes this flower seem full and dramatic. A great choice for sure, you don’t want to forget this one. White peonies are truly the jewels of the wedding bouquet. If you struggled with choosing which white peony to choose, I understand. Deciding between white with pink flecks or varities that open with this yellowish creamy center can be frustrating. For the bride that wants pure white, I think this is the best variety because it really doesn’t have much, if any, of that yellow that stands out in an all white bridal bouquet. Needless to say, the whitest variety I’ve seen. Remember this one for sure. Out of all the “new” peonies I’ve enjoyed this year, ‘Sweet 16’ has to be my new favorite. It’s a little darker than the ‘blush’ most people want in the wedding world. This peony is an absolute showstopper. It’s large and has a pretty balance to it, not a single blossom and not packed with petals either. It opens gracefully because these huge petals are amazing. Almost every single flower that I saw in this batch opened beautifully. I just can’t say enough about this variety because my jaw dropped open from the very first second I saw it open. Truly a work of art to be used in designs. The flower business is constantly changing with new varieties replacing old. With some crops this is easier than others. Change in the world of peonies is truly slow. Because South America joined the world in peony production, they have brought many new varieties to our markets. I can’t wait to see what treasures they’ll send our way this winter! !